First thing You have to know about betting sports is YOU WILL LOSE! Your goal should be to lose less than You Win. Anyone telling You that their system is 70 percent successful is a liar. It is a known fact that the best handicappers in the world cannot hit 70 percent. There are some that have hit in the mid 60 percentiles but they are rare and have not sustained that number for a long period of time. Make sure the percentage You are looking at is ATS (against the spread) not straight up. Anyone, can pick straight up winners at a high percentage. Case in point, there is a cbs expert picks page that claims incredible percentages but when looking closely they are not lying, they are just misleading. Never did they say their percentage of winners is ATS even though they do give you ats picks. So, am i saying the CBS experts picks are dishonest? No way, that page is for entertainment and they are not selling picks but this type of number gets in People's minds and they think they can take the advice from that page and go to Vegas and hit 70 or more percent on their bets not realizing that this page is not picking over 50 percent ats but well over 50 percent straight up. Straight up means nothing in sports betting unless You are playing the Money line and No One does that on a routine basis. Did You know that in 2015 in NCAA BB the home team won 67 percent of the time but the home team only won 47 percent of the time ATS? So a monkey could pick straight up winners by picking the home team every game and say they pick at 67 percent on winners but how is the monkey ATS? If they cannot prove past results then do not buy picks from them! Plenty of systems claim crazy unrealistic percentages: I went 10 of 12 yesterday, here are my 4 picks today for 49.95, Buy now! Best picker in the industry, bar none! If the site where You are considering buying picks from does not publish their past picks, do not give them any consideration. If they were good they would want to publish past performance. The reason they do not post past performance is it isn't good or at least not as good as they are telling you it is. Current Customers will police the claims if the handicapper post past performance. If You use a handicapper that shows what happen yesterday and the week before, they are most likely telling the truth because they have customers that either won or lost because of those picks and if they post lies the customer will surely rat them out. If You bought picks from "Joe's best picks" yesterday and had 3 winners and 5 losers but then saw that Joe posted that He had 7 winners out of 8 yesterday, You would expose Him on social media and wherever else You could for being a fraud so most of the time if the site is posting results, they are truthful. As You can see from the screen capture above this sports handicapper is hitting 54.1 percent on NCAA Basketball for the full season, 58.7 percent on NBA picks and 58.6 percent on NHL picks all through March 20, 2015. This handicapper has days of 10 for 12 but they do not brag about those days. Long term results is all that counts. Any percentage over 52 percent is a good return on investment since this is the standard break even number. This takes into account the juice that the sports books keep. If the numbers in the 50's do not seem so great it is because You get used to the liars. 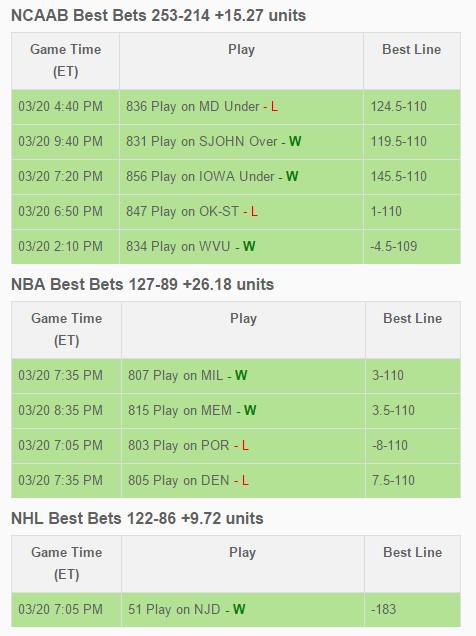 The liars boost their picks by saying 9-1 on "lock of the week games", 70 percent ATS yesterday on playable NBA games. Playable NBA? Vague boasting is common in the industry, but it means nothing. Give Me x number of bets and give me a good return over a long period of time and show me the proof! I do not care if You went 10 for 12 yesterday, I want to know Your record for the full season. If Your full season record is 45 and 82 and You went 10 for 12 yesterday that tells Me You most likely will have a losing day today to make up for the winning day yesterday. But only 1 percent of all sports bets are placed legally in Las Vegas, all others are either illegal or in other states or Countries. It is important to use a system that gives You the tools that are needed no matter if You bet in Vegas or with an offshore sports book.